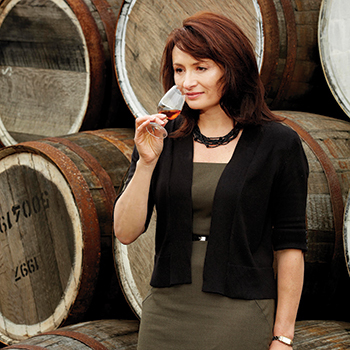 Rachel Barrie, master blender of Morrison Bowmore, reveals what it’s like being a woman in a male dominated industry, writes Becky Paskin. It’s been two years since you left Glenmorangie for Morrison Bowmore – was it difficult leaving a company you were with for 13 years? It was hard, it’s a bit like divorce after you’ve been with someone for so many years, but I was so ready for a change. It was an opportunity, rather than a challenge. Who I work with day to day is very important to me and culturally Morrison Bowmore’s a fantastic company with a great ethos. What makes working at Morrison Bowmore so great? Even within a week of starting it was like paradise, because they have a wonderful long term approach to distilling and maturation, so they have a fantastic stock profile of whisky that goes back to 1957 – we sold our first £100,000 bottle on Christmas eve. Very few malt distillers can say that they still have prized stocks like that. Old whisky has amazing chemistry and flavours; tasting whisky from the 1960s isn’t exactly like being a child in a sweet shop; it’s more like an adult in paradise. Having tasted over 120,000 casks in my time, that 1960s cask was an eye-opener. At Morrison Bowmore you’re regularly working with four very unique and different distillery styles. Do you find that a challenge jumping between them? It’s a wonderful challenge and getting into the personality of each whisky is fascinating. I’m from Aberdeenshire, so my first taste of whisky was Glen Garioch at the age of seven. As soon as I start working with Glen Garioch I’m straight into my Grandma’s kitchen and the feelings of climbing the hills as a child, whereas with Auchentoshan I’m a scientist and as soon as I start working on triple distillation it turns my science side on. So I have no problem at all switching between those. Then Islay is my escape. There’s part of me that’s a free spirit and very elemental. You access a different place in your mind when you’re working with each whisky; a different aspect of your personality. One of the things you’ve pioneered at Morrison Bowmore is the Bowmore water programme. What’s the best kind of water to use with whisky? The water has to be as clean as possible, so taste your water first and ensure there’re no tainted notes. Make sure it’s room temperature, clean and pure. I did an experiment looking at the PH of mineral water, to find the effect of soft, neutral, and hard water on whisky. When you taste the waters individually there’s not that much difference in terms of the palate, however when you had the same amount to a Bowmore 12, it’s amazing how the result is quite different. Mineral water reveals more texture, chalkiness, floral and herbal notes; while soft water gives sweetness of honey and lemon. If you add acidic water you release more peat, which is remarkable. You’ve been a part of the whisky industry for 22 years, how has it changed in that time? When I started in the industry I was the element of surprise at tastings – a young female conducting a tasting, how dare she? Whereas now there are 19-year-old female whisky drinkers really into it. In New York I had 150 women aged under 40 in one room enjoying whisky, and that never would have happened before. As an industry we are making whisky accessible for more people and the demographic will continue to widen and get more women into it. In fact it was a woman who inspired you to become more involved in whisky, wasn’t it? When I was employed at the Scotch Whisky Research Institute there was a lady called Sheila Burtles, who was my first inspiration because she designed the flavour wheel for Scotch whisky along with Dr Jim Swan in 1979 and that wheel is still in existence today. She was a trailblazer at the time. She’s the one I admired most then because then it was a much harder world and more of a challenge for a female to be in whisky, but she broke down the barriers. Do you feel you’ve been able to follow in her footsteps? I’m lucky that I’ve joined the industry at a time that I’ve been able to make a contribution to the development of the industry, brands and communication and hopefully bring more women into whisky as well. I wanted to be a master blender for many years, but I’d also like to be more of an ambassador for the industry as well. I work among the research management committee for the Scotch Whisky Research Institute and with the Scotch Whisky Association as well. I like to think of myself as an ambassador for the industry as well as the brand.